Pelenna Patchworks: New from Moda, the Blue Barn fabric range by Laundry Basket Quilts! New from Moda, the Blue Barn fabric range by Laundry Basket Quilts! 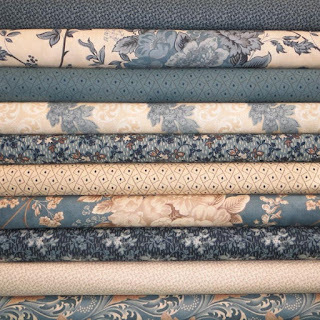 We love the delicate colour palette of these new fabrics from the Blue Barn collection by Laundry Basket Quilts for Moda. Inspired by the designer coming across a blue barn on a snowy winter's evening, the colours include the blues and greys of the building contrasting with the creams of the snow and landscape, and the prints include a variety of florals and blenders. It's rare a floral range is perfectly suited for winter, but this range is ideal for warming winter quilts and accessories! Also, briefly, we have finally managed to source a new, small rotating rotary cutting mat with imperial markings. 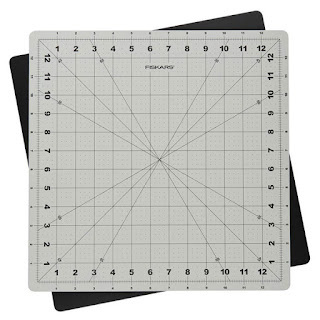 From Fiskars, this 14 inch square self healing mat is perfect for squaring off blocks and cutting intricate applique shapes, and is small enough to take to class!